I realized the other day that, even though it has been some time since Jorge and I began our foray into Facebook games, I haven't actually written much about them. Fear not: this isn't going to be a post dedicated to pro tips on min-maxing strawberry production (although I have some thoughts on that). Instead, I'd like to recommend what I believe to be a quality "gateway" game for traditional players interested in social games: PixelJunk Monsters Online. 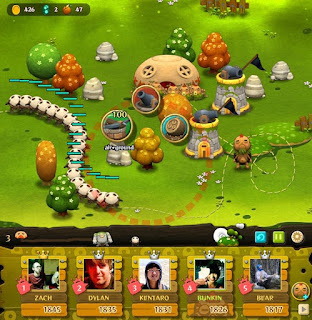 PixelJunk Monsters Online is a clever take on a few familiar concepts and it manages to leverage its platform without indulging in the many of the more questionable habits other Facebook games exhibit. Like its console counterpart, it's a tower defense game, and a fairly traditional one at that. After a round of building stationary defenses, lines of enemies with various abilities and strengths stream towards your base. The more enemies you stop and the more upgrades you make, the higher your score. It's a simple, yet challenging game that is well suited to leaderboard dynamics. There is always a better, more efficient way to defend a stage and since you're playing on Facebook your friends will be able to prove it. On-line leaderboards come naturally to Facebook and, since the game is free, it is much easier to build up a group of players to compete against. From a mechanical perspective, I've always found tower defense games to be most enjoyable on the PC. Being able to quickly click on defenses and areas of the map is faster with a mouse and the static playing field and cartoonish graphics don't lose their impact when played on the small screen. Strategically queuing actions is usually the key to victory, but actively controlling your avatar to collect items before they fade away has saved me more than once. These actions are perfectly suited to the strengths of the mouse and are not dependant on high production values. This isn't to say that PixelJunk Monsters Online is aesthetically boring. Q-Games brings a fittingly whimsical art and musical style that, while more cartoonish than its console counterpart, is still distinct. I admire the game most for its ethical implementation of common Facebook game payment schemes. Like most other Facebook games, Pixel Junk Monsters Online limits the amount of progress you can make in any one play session. Expend all your in-game currency and you'll have to wait a few hours before you can access any new levels or search for more powerups. "Rainbow juice" can be used to automatically open levels and can be bought with real money, but it can also be won though skilled play. Clearing stages perfectly yields rainbow juice, which essentially means that the better you get, the more you can play. Whereas many Facebook games give you no other way to earn more currency besides begging your friends or trading it for cash, PixelJunk Monsters Online offers a proposition. Practice, improvement, and success are rewarded by longer play times and a richer social experience (it's annoying to be bumped from the top of the leader board, regardless of whether you're king of stage 1 or 100). Someone without a lot of money to spend won't be priced out of the game, whereas people with cash to spare have the luxury of skipping the grind if they so choose. Either way, you have access to two legitimate ways of playing the game: you can go for high scores or push yourself to explore all the stages. By allowing for both these options, Q-Games has made a social game that respects your time, your money, and your friends. 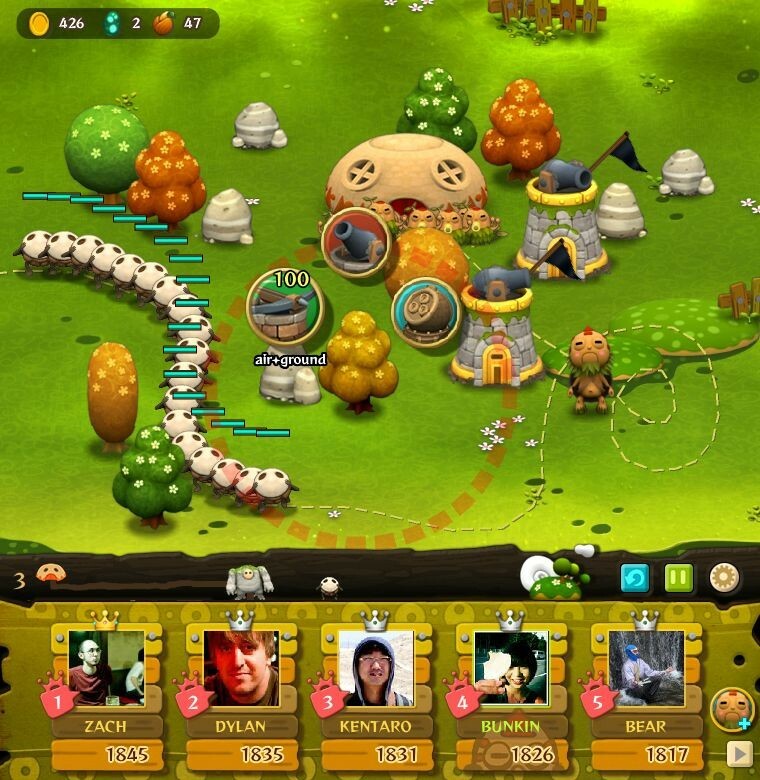 Instead of leveraging players and their social connections as pure assets, PixelJunk Monsters Online rewards skill as much as it does free time, money, or the number of friends you have. At its core, it taps into an ethos that dates back to the arcades: money can buy you more time, but only practice and skill will make you better at the game and allow you secure your spot in the most enviable social position: the top of the leader board.